1. Company: If you belong to a company of not just leave blank. 2. VAT Number: This number is assigned to some companies, if you do not represent a company or don't have the number just leave blank. 3. Gender: Click on the round field of your gender. 7. Address line 1 and 2: Fill in your home address or the place where you want the items to be delivered (*It can be modified later), If you need more space use both lines, if not, leave line 2 blank. 8. Floor: If the address described before is on a building or housing complex. 9. Zip code / Post Code: The postal code of your city, for example 92563 or 62170, etc. 10. City: The name of the city you live in. 11. Country: Select your country from the list when pressing the small black arrow on the right. 13. 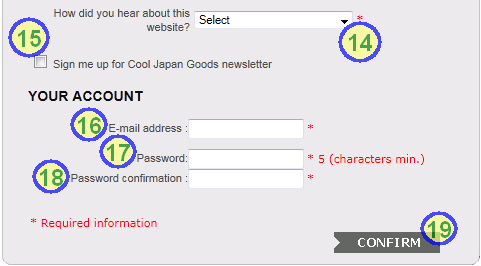 Check the square box if you are an adult on your country (usually 18 ), otherwise those contents will be hidden for you. (a). Search engine: If you found the product or the site by using a search website like Google, Yahoo or others. (b). A friend: If you were introduced to the site by a friend. (c). An article: If you ended up in the site after reading news or an article somewhere. (d). Advertising: If you clicked on a banner or picture and ended up here. 15. Check the box if you want to receive information about offers and new articles on the website (*we won't spam your e-mail address). 16. E-Mail Address: this is the e-mail address that will be used to access your account as well as receive the receipts, tracking numbers and information about your orders. 17. Password: The password to access your account, we recommend you to use something easy to remember but hard to guess. 18. 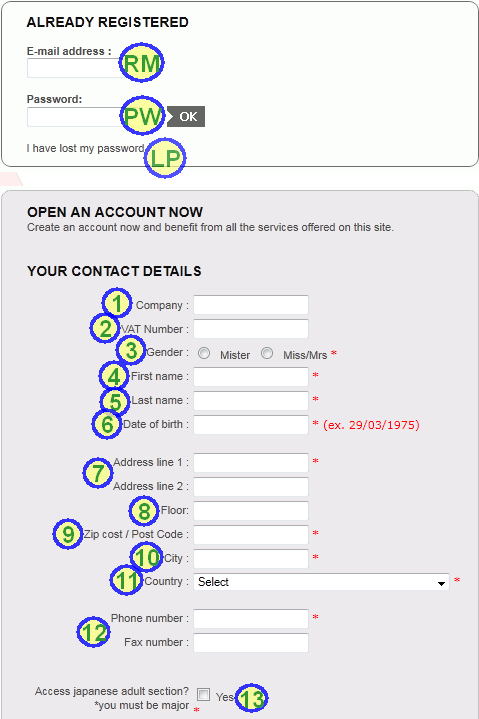 Confirm password: This is a confirmation for you to make sure you fill-in the desired password on the previous field. 19. Hit Confirm to send the registration form! RM: Write the e-mail address you used when you made your account. LP: Click on this line if you forgot your password, so we can send you a new one. (We do not ask for your passwords. NEVER give it to anyone you don't trust). Welcome and enjoy what CoolJapanGoods have prepared for you!